When making the most professional presentation and proposal is needed, all you need are Wilson Jones Gold Line Insertable Tab Indexes. These tabbed Gold single sided insertable indexes make giving your presentation the perfect professional look easy as well as giving lasting durability so you don't have to worry about traveling around. Available in clean-looking white, or classic professional buff, these sheets can even be formatted and printed on with laser or inkjet printers for full customization. Check out these double gold insertable indexes today. Welcome to MyBinding.com. 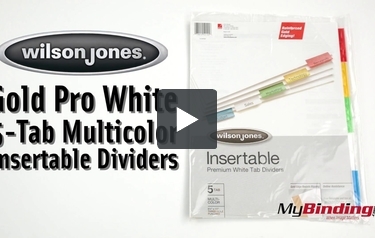 These are the Gold Pro White 5-Tab Multicolor Insertable Dividers from Wilson Jones. Gold Pro dividers stand apart from the rest. Heavy duty bright white paper, double sided gold reinforced 3-hole binding edges and long lasting multicolor tabs make for some of the highest quality dividers on the market. Each set comes with a sheet of perforated labels you can write on or print out with standard software. Gold Pro dividers are also available in manilla paper and clear tabs. For more videos and all your binding needs, go to MyBinding.com.